Just what should you include in the perfect online store? This chapter looks at what works best and the kind of features required in an online store to truly engage shoppers. This chapter also considers things like payment processes as well as what colours your website should include. How do you engage shoppers and get them to press that buy button? This chapter explains how. What will the online shopping world of the future be like? This chapter explores the possibilities suggesting that online shopping may even come to the rescue of traditional bricks and mortar retailers who feel beleaguered by Internet retail. 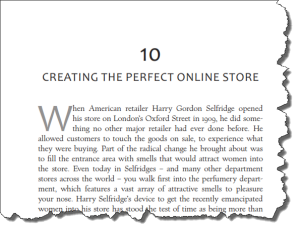 This chapter also suggests that shoppers will increasingly want narrow niche sites rather than big sprawling web shops. 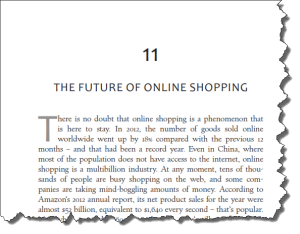 Inside this chapter you’ll discover what online retailers need to do to plan for the future of Internet shopping. 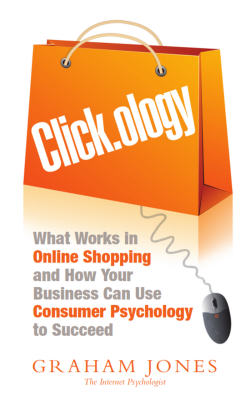 In this final chapter of Click.ology the CLICK System of establishing a great online retailer is discussed. This chapter shows you what you need to consider in order to create the right web presence for the shoppers of today and in the future. 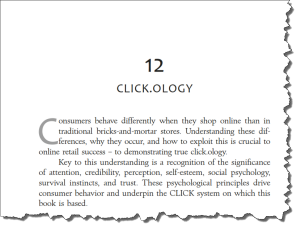 The chapter takes you through the elements of the CLICK system demonstrating a simple five-step process to online retail success.